Since the announcement of Tim Pigott-Smith’s death on Friday 7 April 2017 tributes have flooded in for this much-loved and admired actor. Many have also commented that in the last few years he was reaching his peak. His kindness and charm have been commented on almost as much as his qualities as an actor so it’s rather a pity that the role which made him famous and for which he will probably always be best-remembered was as an out and out baddie, Ronald Merrick in the brilliant 1980s TV series The Jewel in the Crown. I’ve seen him more often on TV than in the theatre, having missed for instance his successful King Lear for the West Yorkshire Playhouse in 2011. I did though catch his performance as Prospero in The Tempest at the Theatre Royal Bath, directed by Adrian Noble with a cast full of other actors who have been RSC regulars. Pigott-Smith gave a wonderfully generous performance in which he also communicated his enormous enjoyment of being on stage. The most recent time I saw him in the theatre was on another memorable occasion in March 2013 when he played the Chorus at two performances of Henry V for Edward’s Boys, the acting company of boys from King Edward VI School in Stratford. It was exactly 100 years since “the Boys of Shakespeare’s School” had put on two performances of the play in the Shakespeare Memorial Theatre, encouraged by Frank Benson. On both occasions only the role of the Chorus was taken by a professional actor, in 1913 Nancy Price, and Tim Pigott-Smith in 2013. Even more appropriately, Pigott-Smith had attended KES himself, becoming Head Boy. 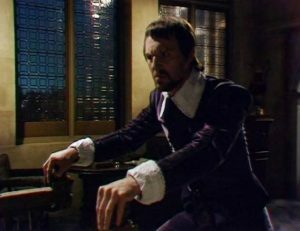 He played the part in the gown of an old-fashioned schoolmaster, seated on a wooden chair just like the one in Shakespeare’s schoolroom. The 1913 performance had added poignancy because all the boys who took part in it were later involved in the First World War, seven of them being killed in conflict, and the 2013 performance, given within the same space the first had been, was a very special event. King Edward VI School is good at remembering its past – when I spoke to their assembly last week the Headmaster pointed out to me a corridor wall covered in newly-digitised and printed photographs of the whole school, some of which went back over 100 years. 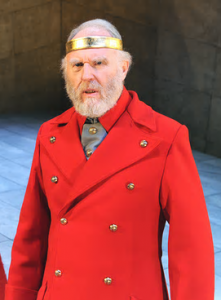 Tim Pigott-Smith’s performance at the school may not have been a particularly important one in his career, but it is already one of the highlights in its recent history, and his death will be greatly mourned. He is currently being seen in the BBC adaptation of Evelyn Waugh’s Decline and Fall, and Mike Bartlett’s fantasy on the succession of the current Prince of Wales in which he starred, Charles III, has been filmed and is to be screened on BBC2 later in 2017. Looking back at his Shakespeare career, he featured in two of the BBC Shakespeare series of the 1980s, as Angelo in Measure for Measure and Hotspur in Henry IV Part 2. The whole series has been made available so it will remain possible to see him in these Shakespeare roles. 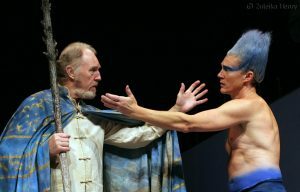 As a stage actor with the RSC he made several Shakespeare appearances in the 1970s, notably as Posthumus in Cymbeline. Just a week or so ago I was lent a copy of Julian Curry’s Shakespeare on Stage volume in which the author, himself an actor, interviews actors who have appeared in important Shakespeare roles. One of these, which I had already read, was the interview with Tim Pigott-Smith about his performance of Leontes in The Winter’s Tale at the National Theatre and on international tour in 1988. The interview took place in 2006 and in spite of the 18-year gap it’s clear that he remembered the rehearsals and performances very clearly. He spoke very frankly in the interview about conflicts between actors and the director, and the technical difficulties they faced. He also recalled the thinking behind some of the decisions made, and how performances can change during a run. Speaking of the moment when as Leontes he had to reveal his jealousy, he admitted “It’s an astonishing moment. Very tricky…it really is a huge shock. It took me a long time to learn how to do that so it didn’t blow the audience out of their seats, and make them think “What’s going on here?…I don’t understand this at all!…It’s a major problem of the part, to take the audience round that corner”. We are fortunate that the book makes it possible to find out how one of the most successful actors of modern times approached playing one of Shakespeare’s most challenging roles, made poignant by Tim Pigott-Smith’s sudden death. Some of the articles about Tim Pigott-Smith are here: from The Guardian, The Telegraph, another from The Telegraph about Charles III and one also about Charles III from The Guardian. This entry was posted in Legacy, Shakespeare on Stage, Stratford-upon-Avon and tagged Edwards' Boys, Henry V, Julian Curry, King Edward VI School, King Lear, Shakespeare on Stage, The Tempest, The Winter's Tale, Tim Pigott-Smith. Bookmark the permalink. A lovely piece, and a fitting tribute to a fine actor and a great man; alternatively a great actor and a fine man, both options equally true.